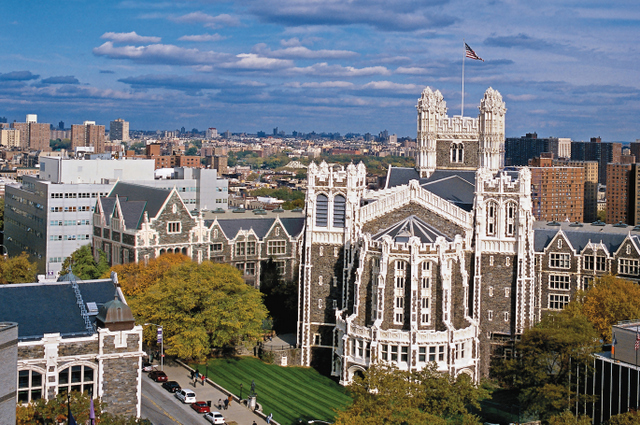 The City College of New York (CCNY) is one of the most searched for colleges in America, according to a recent internet keyword search of basic two and four year colleges. City College, formally known as the City College of the City University of New York, is a public, four year, CUNY college established in 1847. 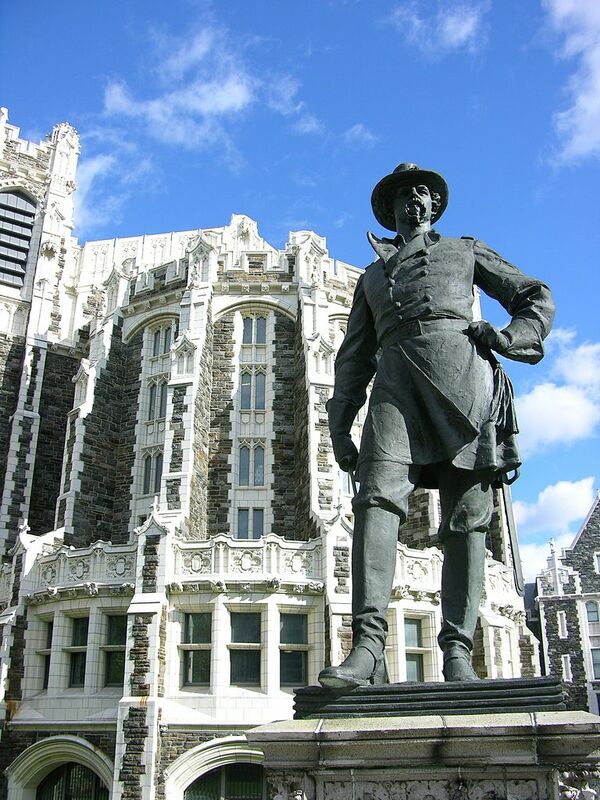 City College has a rich and distinguished history. CCNY has a student faculty ratio of about 11 to 1. The college does not offer evening degree programs, but the days are packed with much student activity. CCNY has graduated 12 future Nobel Prize winners, which is more than any other public University in America. There are too many notable former CCNY students to count. In addition to the dozen Nobel laureates, famous former attendees of CCNY include important artists, businessmen, politicians, scientists, and even an astronaut. Among the former students of CCNY are filmmaker Woody Allen, actor Judd Hirsch, politician Henry Kissinger, fashion designer Ralph Lauren, inventor Jacob Rabinow, actor Edward G. Robinson, writer Bertrand Russell, actress Gabourey Sidibe, inventor Jonas Salk, writer Upton Sinclair, and many more. 1. Where is City College of New York? City College is located at 160 Convent Avenue in the Harlem section of New York City, 10031. 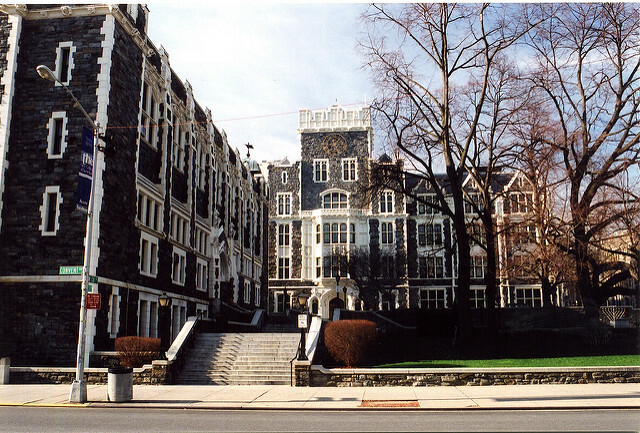 The CCNY campus is situated between 130th and 141st Streets in Upper Manhattan, between Amsterdam and St. Nicholas Avenues. City College's downtown campus, the Center for Worker Education (CWE), is located at 25 Broadway in the Wall Street area of Manhattan, on the 7th floor of the Cunard Building. The zip code of the downtown campus is 10004. 2. What courses and programs are offered at City College of New York? The most popular majors at CCNY are Biology, Business Administration, Communications, Economics, English, Humanities, Mechanical Engineering, Psychology, Sociology, and Visual Arts. 3. What types of certificates and degrees are available at City College of New York? City College offers Bachelor of Arts degrees, Bachelor of Science degrees, and Bachelor of Architecture degrees at the undergraduate level, as well as Master's degrees and PhDs at the graduate level, in any or all of the courses outlined above. However, most people are unaware that CCNY also offers occupational certificates, which can be used for finding employment, or for improving skills at your existing job, thereby earning more money. 4. Who should attend City College of New York? City College of New York is an excellent choice for many types of students who live in or near New York City, especially those who score 1250 or better on their SATs, and had a high school GPA of around 90 percent. City College is especially suitable to students interested in the field of Physics. CCNY has an award winning Physics department, with three (3!) of the school's graduates later becoming Nobel Laureates in the field. CCNY is also a generally good choice for students of lower income, who should feel right at home on the New York City College campus, where many students occupy the lower income quintiles. 5. Why attend City College of New York? City College is an actual University, without the typically high cost of a university. People don't save much money by living in New York City. However, they can save good money on their college educations by attending CCNY instead of, let's say, Columbia University right down the street. The difference in tuition is noticeable, to say the least. What's more, the median income for CCNY graduates is surprisingly high. Other benefits of attending CCNY include easy access and all the conveniences of living in (or near) America's largest city. City College is, if nothing else, accessible. However, it is also competitive. 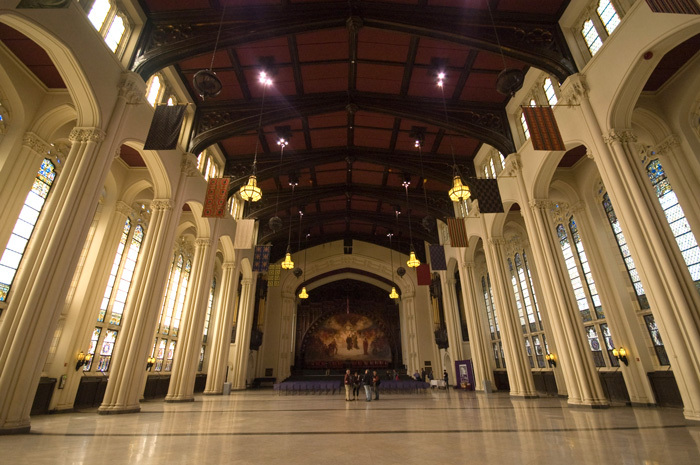 The acceptance rate for CCNY is only 38 percent, but New York City is a big place. In the event that you are not accepted to CCNY, you can also apply to other CUNY colleges throughout the five boroughs, such as CUNY Brooklyn College, CUNY Hunter College, CUNY Baruch College, CUNY Lehman College, CUNY York College, CUNY College of Staten Island, CUNY Queens College, and CUNY New York City College of Technology. Other nearby community colleges and trade schools include Bronx Community College and Hostos Community College. 6. How much does it cost to attend City College of New York? According to the CCNY website, the cost of tuition for non resident students to attend City College is $560 per credit, or $840 per credit for non degree courses. Resident students who live on campus pay $3,165 per semester. Part time resident students pay $275 per credit, or $400 per credit for non degree courses. The net price of attending CCNY full time ranges from about $4,540 to $14,365 per year, depending on the student's household income. Other fees and deposits may also apply. For instance, there is an undergraduate “student activity” fee of $63.50 for full time students and $40 for part time students. Other fees include a Consolidated Fee ($15), a Technology Fee ($125), a Student Senate Fee ($145), and an application fee ($5 to $125, depending on the application). The average cost after financial aid for students who receive this aid is $7,125 per year, according to financial info reported on niche.com. 7. How long does it take to earn a degree or certificate at City College of New York? Normally, it takes about four years of successful full time enrollment at CCNY to earn a Bachelor of Arts degree or a Bachelor of Science degree. Most Master's degrees take approximately six years to complete. It takes roughly eight years to attain a PhD. Some occupational certificates can be completed in two years. Still, the length of time it takes to complete your degree is somewhat up to you. You can enroll at CCNY as a part time student, in which case you will take longer to earn your degree. Or you can take extra classes and earn your degree that much sooner. 8. What is the City College of New York campus like? 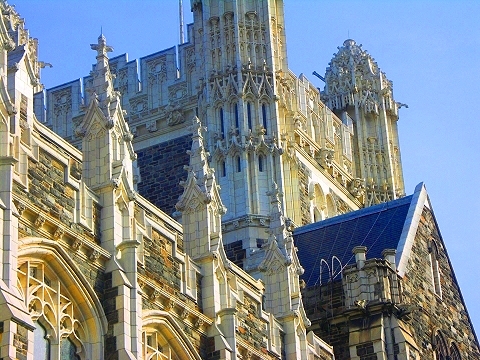 The CCNY uptown campus spans 35 acres and features five Gothic-style buildings, originally designed by architect George B. Post. These five original campus buildings are officially registered landmarks. These stunning examples of Gothic architecture are called Shepard Hall (modeled after a Gothic Cathedral), Bakersville Hall, Compton Hall, Harris Hall, and Wingate Hall. Since then, a number of newer, more modern buildings have been added, and extra land has been acquired. Freshmen live on this campus in student residence halls. The CCNY campus features more than 200 clubs and student-run organizations. The CCNY athletic teams are called the Beavers. The team colors are black and lavender. Sports on campus for men and women include baseball, basketball, cross country, indoor / outdoor track and field, lacrosse, soccer, volleyball, and fencing. 9. What is the City College of New York neighborhood like? Area attractions near the main campus include Columbia University, located about a mile and a half southwest of CCNY. Adjacent to the CCNY campus is St. Nicholas Park. Just across the Harlem River is Yankee Stadium. Nearby are many stores and restaurants. Also nearby is a New York City subway station and the MTA Regional Bus service. The downtown campus (the Center for Worker Education) is located just one block north of Battery Park. Other nearby area attractions include restaurants, museums, the New York Stock Exchange, and of course easy access to public transportation. 10. Does City College of New York offer distance learning? Yes. City College offers a hybrid blend of online and classroom learning. Online classes are similar to classroom study, since they involve assignments, quizzes, and exams. Students are also expected to meet with teachers face-to-face some of the time. Most classes at CCNY feature this hybrid capability. 11. What is the contact information for City College of New York? You can contact the main switchboard of CCNY by calling 212-650-7000. To reach the downtown campus, call 212-925-6625. To contact the admissions office, call 212-650-6977, or send an email to admissions@ccny.cuny.edu. To contact the financial aid office, call 212-650-5819, or send an email to financialaid@finance.ccny.cuny.edu.